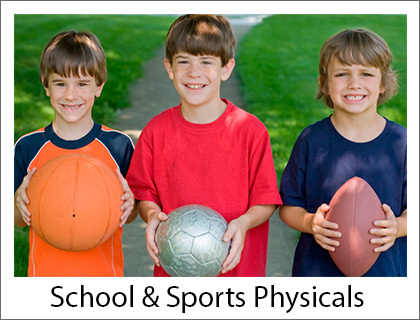 If your child is enrolling in school or planning on playing sports in the upcoming year, he or she will need to receive a school or sports physical. Davam Urgent Care located in Magnolia, TX makes it quick and convenient to have a sports or school physical. Our office is open everyday from 8am-9pm and accepts walk-in appointments during regular operating hours. We also only charge a cash pay price of $25 for the physicals. When you visit Davam Urgent Care located in Magnolia, TX your child will be examined by a board-certified medical provider. In addition to reviewing your childs medical history, the provider will also check to see if anything is abnormal and if they are at risk of developing any medical problems. Typically, depending on the physical form based off of the different school districts, the ears, eyes, throat, nose, and more will be checked. Davam Urgent Care can also take x-rays using our on-site digital x-ray machine and perform lab work using our fully equipped lab, if necessary. Below are links to the surrounding school districts 2017-2018 physical forms. Please bring the form with you to your visit. If you are unable to do so, we also have copies available at the front desk. For more information about Davam Urgent Care located at 6022 FM 1488 in Magnolia TX, please contact us at (281) 583-1980. Our clinic is a full service urgent care for non-life threatening illnesses and injuries. Davam Urgent Care services the following zip codes in Magnolia, TX 77354, 77353, 77355. We also service the surrounding neighborhoods of Glen Oaks, High Meadow Ranch, Westwood North, Cimarron Creek, Wildwood Estates, Westwood, Lake Windcrest, Montgomery Trace, Sendera Lake Estates, West Alden Bridge, Woodforest, and more.